Learning about different types of grapes and the wine they make, comparing French and American wines, and even viewing “The History of Civilization in a Six Pack,” are part of a series of fun and instructional classes offered by Rosen College of Hospitality Management this month to benefit UCF’s Live United campaign. All the classes will be taught in the state-of-the-art Anheuser-Busch Beer & Wine Lab at the Rosen campus, 9907 Universal Blvd., Orlando. Participants must be 21 and maximum seating is 50. Each class costs $20. UCF’s United Way campaign is kicking off this week. The university goal for October is $150,000 to benefit charitable agencies and programs in Central Florida. The History of Civilization in a Six Pack, 6-7:30 p.m. Friday, Oct. 4. Instructor Ed Measom, an adjunct at Rosen, founded the Professional Beer School and is a member of the American Homebrewers Association, Florida Brewers Guild and the Central Florida Home Brewers. He’s an award-winning brewer and competes in several brewing competitions each year. He has a chemical engineering degree from the University of Connecticut and an MBA from Rollins College. A comparison of French and American wines, 6-7:30 p.m. Friday, Oct. 11. Participants will learn about and taste reds and whites. Instructor of the class, Dr. Frank Juge, taught the first UCF course about the chemistry of wine and winemaking in 1975. A certified advanced-level sommelier, he has also grown a grape arbor and made wine as a hobby. In 2003, he joined the Rosen College faculty as a professor of hospitality management. Food and Beer Pairing, 4-5:30 p.m. Oct. 13. This class will give advice on how to pick the right beer to go with meals. The class also will be taught by Measom, an adjunct at Rosen. Introduction to the World of Wines, 6-7:30 p.m. Oct. 25. Dr. David Black will talk about the basic grape types and the wines they make. 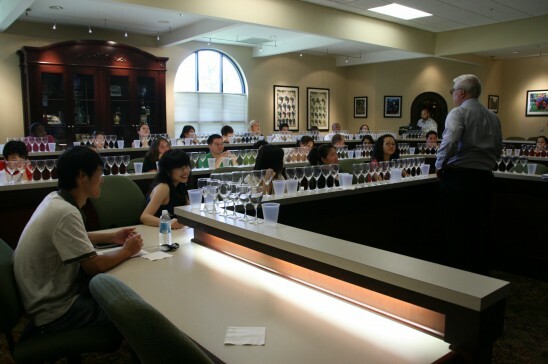 Black has more than 30 years of experience in fine wine and spirits, including a five-year Master of Wine Program, studying viticulture, winery techniques, business, blind tasting and evaluation. He has traveled extensively to major wine regions in France, Italy, Germany, Spain, and California, and has been an instructor at Rosen since 2009.